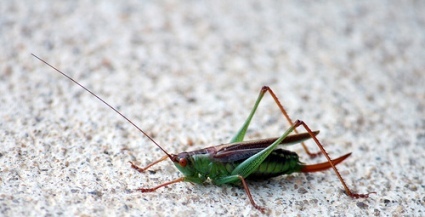 C-Thunda: We learned about grasshoppers today at school. My teacher taught me about them. Granddaddy: Oh yeah, baby? What did you learn about them. C-Thunda: We learned they like to hop around on the grass. Granddaddy: Did you see any? Granddaddy: It’s a good thing no birds were around. Birds eat grasshoppers. C-Thunda: Yeah, and the grasshoppers don’t like that. I have to say that little story made me laugh as hard as I’ve laughed in a while. But then again, I had the benefit of being the audience. I used to catch grasshoppers and feed them to our geese. Grasshoppers don’t like that either. Great story. Grasshoppers hate being eaten. LOL! Very cool you documented this conversation.